I had thought to write a short piece on Skiddaw but The Dog thought I ought to check to see exactly which lump it was that was sticking up in our picture. The trouble is, I’m not too sure where we are with respect to everything else. What I could do with is a compass and a map. Not just any old map, though. Road maps concentrate on roads – and roads, very sensibly, don’t climb mountains. So people who want to know where roads are going to, or coming from, should be content with that much information. They should not ask awkward questions about the names of the large, very obvious, bits and pieces of scenery, that really just irritatingly, prevent straightforward progress. The other problem is I don’t have a compass. So we thought we’d give Google Earth a try, we’re all for modern technology. The Dog would like it to be noted that she does not wish to be included in the above statement. She has heard hints of food bowls that open automatically at a pre-set time and collars that allow you to leave and enter by a flap in the door. She feels that there are enough little black things sticking out of the wall as it is, and she does not want to have to remember to put her collar on charge every night. Even worse there are vague whisperings that suggest that the ‘Private Dog Door’ is actually a ‘Cat Flap’. Well, really! 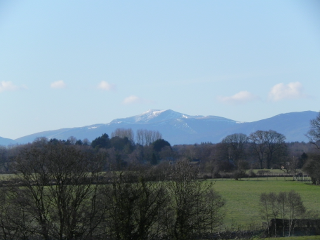 So we looked on Google Earth and this could be Knott, Binsey or possibly Skiddaw. Or even Knott with Skiddaw behind it – you know a duck in front of a duck, a duck behind a duck and a duck in the middle. How many ducks?